Lately, India has faced its biggest fear – women who talk! A lot of women have come up and shared their stories of harassment in entertainment business and similar field of work. It’s not easy to call out men in power. Or, let’s just put it how it should be; it’s not easy to call out men. Patriarchy isn’t news to us Indians, is it? The fact that so many people have come out and spoken of an issue as serious as this is the silver lining. Times are changing and for the better. One woman gives strength to many. It has been very overwhelming for everyone to digest something so shocking. Comedians such as Utsav Chakraborthy and Gursimran Khamba, who are supposed to be the most ‘woke’ and vigilant people of the nation, have also been accused of harassment. I understand that calling out people from such accessible yet influential domains such as comedy, is of primary importance. The youth is idealizing these people. As Khamba stepped down from the functioning of AIB, the lesson of actions having equal repercussions has been reiterated. Owing to the movement, many projects have been put on halt while some have been shut. Hotstar decided to take down AIB’s show from their platform as several allegations associated to the company showed up. Sajid Khan too, stepped down as the director of Housefull 4 after Akshay Kumar cancelled the shoot in protest. In addition to this, Madras Music Academy dropped seven musicians from the Margazhi session due to harassment allegations in their name. Such actions are signs of solidarity that has finally surfaced. This was a much awaited step. We finally see women supporting women. That’s how we empower each other. We have to be the wind under each other’s wings. 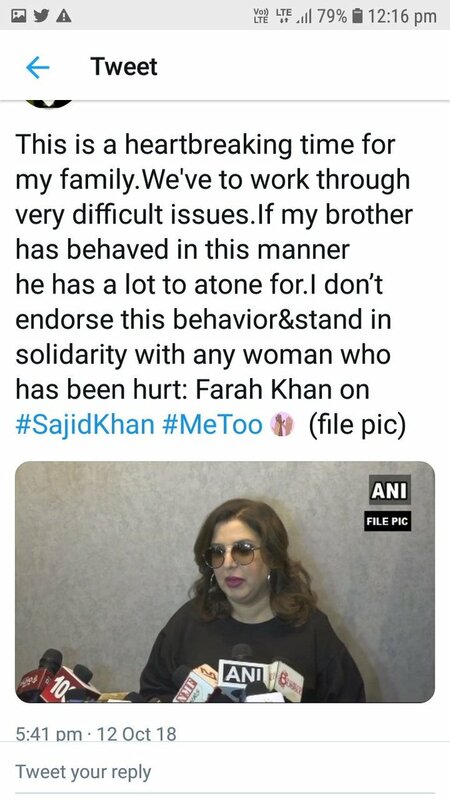 It’s not easy to pick on your own brother or any close one but, women like Farah Khan have been strong and high headed enough to show that courage and have stood with the victims. More power to these ladies! While we do have such great steps taken, there are some people who are trying to spoil the essence of such a movement. 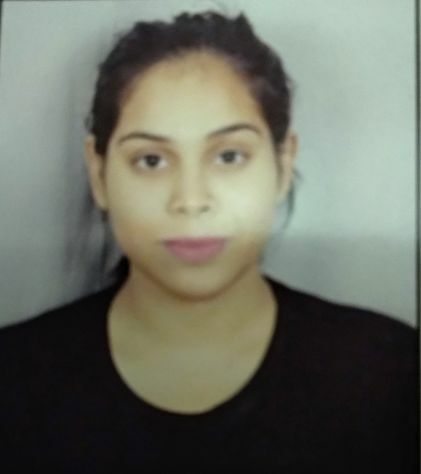 People like Rakhi Sawant have come up and have spoken to media, making bizarre comments on how Tanushree’s account is a lie. Her statement, however, shouldn’t be glorified with any sort of discussion. Another dark side of the story is the false allegations. Some false allegations on some renowned personalities have also risen. This is really toxic. We are trivializing a rather complex and serious cause by reducing it to a mere stunt for publicity. We have to grow out of that. Not all men are the same, nor are all the women. We have to be sensitive about what we believe and what we don’t as well. Let’s be real and also acknowledge the fact that harassment isn’t exclusive to entertainment business only. It’s prevalent at all work places. Women now have to learn from such an important step that people in entertainment industry have taken. They need to voice the unjust that they’ve been through. Pretending that it doesn’t happen in a so called ‘safe work space’ is a sheer compromise on integrity and dignity of women. It’s not easy to speak up about something so traumatic and reliving that experience every time you speak about it. Why do you think these women are doing this, then? It’s for the bigger picture. It’s for you and me to speak up if and when something similar in nature comes our way. It is so that we don’t get hushed by ‘koi nahi sunega’ and ‘char log kya kahenge’. It is also so that no woman is ever again ashamed of something she didn’t do. It is so that every survivor, relentlessly associates herself to an issue as indispensable as #metoo. Logan Paul's suicide video has made one thing clear - the kind of harmful clickbaity content Youtube wants up. Does your boss or coworker lewdly ogle you? Learn how to deal with sexual harassment at work.